Following two years of engagement, a second project is now being planned to build on this work, with a plan to launch a report in 2020, to precede the Global Nutrition Summit in Tokyo. The key aim of this new report will be to build upon the Global Panel’s first Foresight report (2016) as well as recent work by other international organisations, to catalyse action to improve diets and nutrition in low- and middle-income countries. The development and drafting of the Foresight 2.0 report will be undertaken by a team of experts – the Lead Expert Group (LEG), which comprise of nine individuals with notable expertise in one or more of the areas relevant to the report, such as food systems, agriculture, nutrition, sustainability, food markets and economics, as well as political economy and governance. Prof Tim Benton (Co-Chair), Professor, Population Ecology, School of Biology; UK Champion for Global Food Security. Prof Patrick Webb (Co-Chair), Professor, Friedman School of Nutrition Science and Policy; Director for USAID’s Feed the Future Nutrition Innovation Lab. Dr. Julio Berdegué, Assistant Director-General and Regional Representative for Latin America and the Caribbean, Food and Agriculture Organization of the United Nations (FAO). Prof Jessica Fanzo, Bloomberg Distinguished Associate Professor of Global Food & Agricultural Policy and Ethics, Nitze School of Advanced International Studies (SAIS), the Berman Institute of Bioethics, and the Department of International Health of the Bloomberg School of Public Health, Johns Hopkins University. Dr Lawrence Haddad, Executive Director, Global Alliance for Improved Nutrition. Dr Samuel Myers, Principle Research Scientist, Planetary Health, Harvard T.H. Chan School of Public Health; Director, Planetary Health Alliance. Prof Matin Qaim, Professor, International Food Economics and Rural Development, University of Goettingen. Dr. Danielle Resnick, Senior Research Fellow, Development Strategies and Governance Division (DSGD), International Food Policy Research Institute (IFPRI). Dr Marco Springmann, James Martin Fellow, Oxford Martin School, University of Oxford. 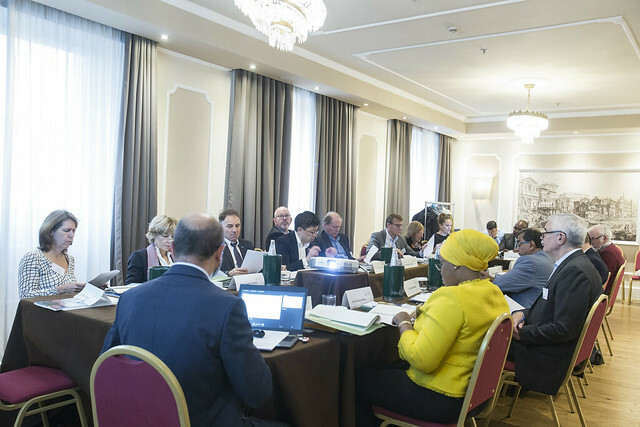 A complementary High Level Stakeholder Group (HLSG) has also been convened to help ensure success of the project through the strategic and practical advice of its members, and their influence in policy environments.